Amazon will make its new headquarters not in some sprawling suburb, but in the heart of downtown Seattle. Recent plans for Amazon's campus reveal that it will take up 3 square blocks with 3 towers supported by lower volumes, and will feature lots of open green space—including green roofs. NBBJ, who also designed the Bill & Melinda Gates Foundation nearby, is in charge of the massive new project for Amazon. Measuring in at 3.3 million square feet, Amazon's campus will be Seattle's largest development ever and it will keep the workforce downtown and encourage sustainable urban development. 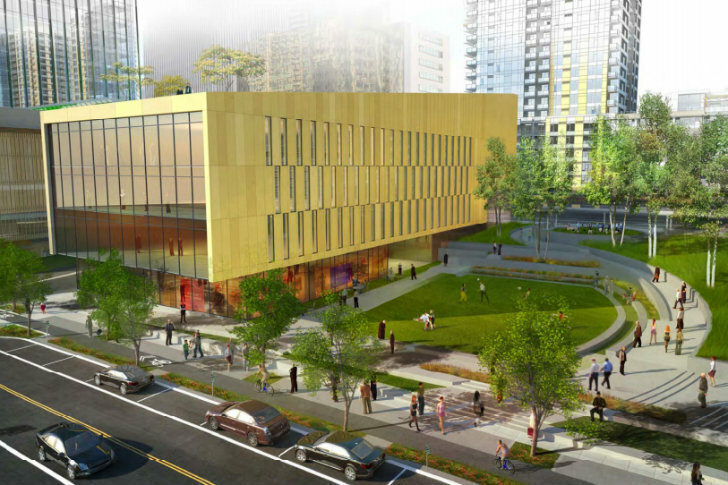 NBBJ released new renderings and plans of Amazon’s downtown Seattle campus in August during a Design Review Board (DRB) meeting. Amazon has already purchased three blocks in the underdeveloped Denny Triangle area in between South Lake Union and the commercial core. The plans show three 37-story towers complimented with lower volumes, open space, parks, green roofs and art installations. Amazon is seeking variances from the city for some of the street alignments and in return will be expected to add back to the city in terms of community amenities – possibly public plazas, a playground or even a dog park. As for sustainability, no word yet on the level of green building certifications the company is expected to reach for, but all we have to say is they better aim high. From the plans unveiled at the DRB meeting, we can tell there are plenty of green roof spaces as well as efficient glazing to provide natural daylighting. Underground parking will keep cars off the street and the company will provide bike parking and locker rooms to encourage pedal-powered transportation. Most importantly, Amazon’s choice to build their huge new campus in downtown Seattle rather than a suburb encourages sustainable travel, will help invigorate the city and promote urban living. The project is expected to begin construction sometime in 2013 and could take up to 8 years to complete. Interesting project, but no north arrows on the drawings or other indication of building orientation on the renderings. Since orientation is critical to sustainable design, knowing that would make it more possible to evaluate the design. 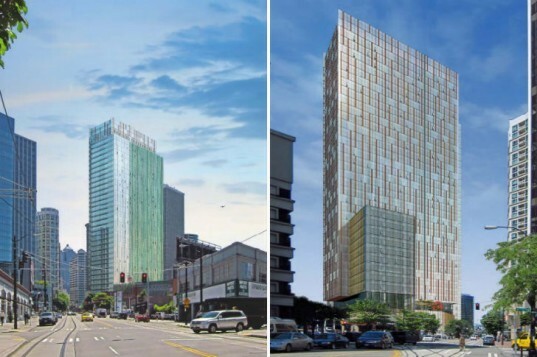 NBBJ released new renderings and plans of Amazon's downtown Seattle campus in August during a Design Review Board (DRB) meeting. Amazon has already purchased three blocks in the underdeveloped Denny Triangle area in between South Lake Union and the commercial core. The plans show three high rise towers complimented with lower volumes, open space, parks, green roofs and art installations. Amazon is seeking variances from the city for some of the street alignments and in return will be expected to add back to the city in terms of community amenities - possibly public plazas, a playground or even a dog park. As for sustainability, no word yet on the level of green building certifications the company is expected to reach for, but all we have to say is they better aim high. From the plans unveiled at the DRB meeting, we can tell there are plenty of green roof spaces as well as efficient glazing to provide natural daylighting. Underground parking will keep cars off the street and the company will provide bike parking and locker rooms to encourage pedal-powered transportation. Most importantly, Amazon's choice to build their huge new campus in downtown Seattle rather than a suburb encourages sustainable travel, will help invigorate the city and promote urban living. The project is expected to begin construction sometime in 2013 and could take up to 8 years to complete. A variety of building sizes and heights will create an interesting landscape for the Denny Triangle area. Site location with respect to the rest of the city. Site plan and basic floor plans.